Ever since Dan Barber's 2015 WastED pop-up at Blue Hill, which repurposed the restaurant's produce peelings, juice pulp, bread ends, and fish heads into a pricey, celebrity chef-prepared tasting menu, New Yorkers have maintained a steady obsession with eating garbage. Or at least, food that would be garbage. See, for example, Mimi Cheng's food scrap dumplings or Sweetgreen's stem salad. The price of a to-be-trash meal often doesn't come cheap, though, with small plates at WastED going for $15 a pop in 2015. But a new food scrap tasting menu is trying to change that -- charging just $21 for a five- to seven-course menu of otherwise-trash food. Famously owned by Homer Murray (one-time bartender Bill Murray's son), 21 Greenpoint opened by Transmitter Park in September 2016, replacing Murray's River Styx restaurant, and the farm-to-table spot has slowly made a name for itself as a legitimately good place to eat, not just a celebrity child's dream project. The restaurant's $21 tasting menu came about when head chef Sean Telo was looking for a way to avoid the restaurant industry's most hated pastime: brunch. 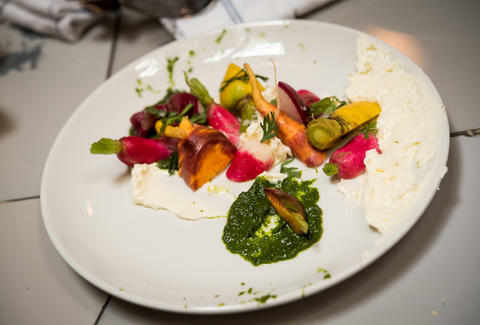 "I wanted to come up with a better model for brunch, because I knew that the owners of the restaurant were going to want [it] eventually, and I'm not a big fan of brunch," Telo says, citing the different crowd and style of service as the main downsides. "I wanted something that was a little more thoughtful, creative, and inventive." He already know his restaurant would prioritize local sourcing and composting, and he "wanted something that would tie that all together." Food scraps, naturally, were the solution. Wood-Grilled Pizza: Pizza or Flatbread? What goes into a food scrap tasting menu? The tasting menu isn't merely comprised of tossed-off, unwanted parts of an ingredient, like a carrot peel, or ugly, bruised apples that wouldn't be suitable for dining-room service. It's made up of all of the perishable ingredients 21 Greenpoint has left at the end of the week. "It's not like we're like, 'Let's get rid of these mussels because they're rotting,' it's just an excess issue," Telo explains of the menu. "We're not serving waste, we're serving what would become waste." The so-called scraps may be whole fillets of fish or cuts of meat, delivered to the restaurant as recently as Saturday, that didn't sell during regular dinner service. "A lot of restaurants at the end of the week just get rid of things like that," Telo says. 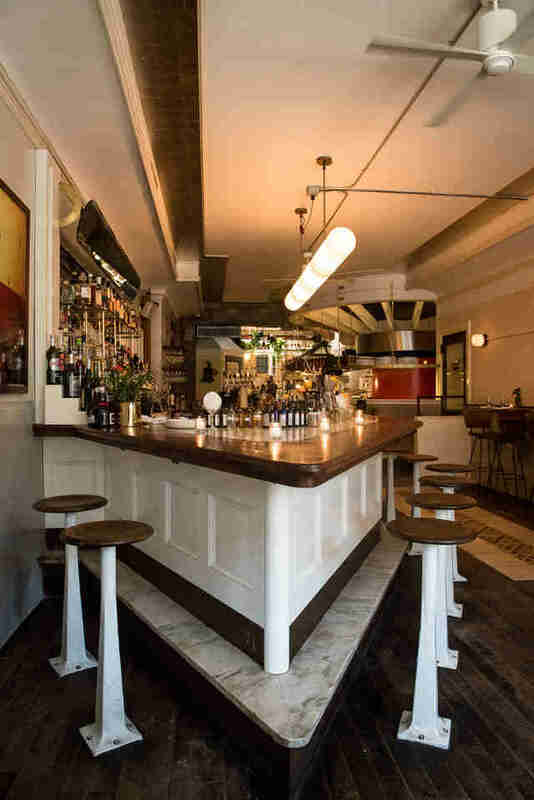 Because 21 Greenpoint is closed Monday, like many restaurants, a piece of fish delivered on Friday and unsold over the weekend would linger in the fridge until Tuesday and "that just doesn't meet our standards," Telo says. Anthony Bourdain once popularized the idea of never eating restaurant fish on a Monday, as it's certainly left over from days before, though he backtracked on that last year. Everything 21 Greenpoint sources is from local farms, mostly in the Hudson Valley, but also in New Jersey, Pennsylvania, Massachusetts, and Maine. "We're getting a lot of amazing produce, a lot of amazing fish, and we wanted to serve that to people," Telo says. "Instead of throwing it away, we wanted to wrap it into something else." Through the night on Sundays, the kitchen will riff on and edit the tasting menu, using whatever ingredients are left over to create a full meal including at least a soup, salad, starch, protein, and dessert. "The goal for us is to walk into our refrigerator Monday and see nothing," Telo says. Telo says he repurposes "really everything" that he can, from tender fish cheeks (a favorite at many a restaurant family meal) to homemade pasta dough. "It's all really fresh stuff," he assures me of the Sunday night ingredients. For example, the restaurant's ever-popular eggplant fries, served with hot pepper oil and goat yogurt for $12 during regular service, are cut into perfect rectangles, meaning the round top and bottom of an eggplant must be hacked off for the visual aesthetic of the dish. Instead of composting or disposing of the rounds, Telo uses them in a pizza sauce or other Sunday dish. Why should diners care about repurposing waste? Research suggests that half of American produce gets thrown away, making the country the world leader in food waste. Not only is this an affront to food insecurity -- imagine how hunger could be solved with all the produce never actually consumed by Americans -- it's also terrible for the environment. Produce that's grown, picked, transported, and sold is just wasted energy and output, and some produce never even makes it to the supermarket or restaurants because it's not attractive enough and consumer demand isn't in line with the current round of crops. Picking out a piece of fruit at the grocery store shouldn't be an act of pageantry -- it should be about taste and freshness. If Americans strictly bought what they needed and cared less about the aesthetics of their farmed and gardened food, there may not be such a severe food waste problem. "We're not serving waste, we're serving what would become waste." How do the ingredients stack up? On the night I visited, our meal started with ceviche (good enough to cost $21 on its own) with succulent and mild fish meat made tart and almost cured by an acidic lime juice. After that, there was a hearty tomato-based vegetable soup with pieces of zucchini and eggplant, followed by homemade spaghetti, thick and al dente, coated in a glistening chicken broth-based sauce and topped with ground pork, like an Italian dan dan noodle. A crisp and flavorful flatbread came next, before the big meat course: a stew, which was somewhat one-dimensional and could have benefitted from more flavor and a longer simmer time, but overall, was good. For dessert, there was a chocolate cake, made completely of crumbs, with a scoop of ice cream on top. The crumbs were decadent and moist, an ingenuous use of cake bits that otherwise would never have made it to the plate -- I would pay for this on its own. The most impressive feat? An Instagram shot of any of these dishes wouldn't immediately out them as leftover compositions. Each dish was plated beautifully -- many were colorful and garnished in a way that could easily disguise them for much more expensive courses. As it turns out, making the food waste taste good is easy; making the dishes look appealing is the real struggle. "The most challenging part about using all parts of an animal or vegetables... is to make it look nice on a plate," says sous chef Njec Seruga, noting that since guests can already be hesitant about the concept of eating food waste, it's extra-important for it to look appetizing. "It's easy to make a great-looking dish when you're using the perfect-looking vegetables and center cuts of beef fillet, but a little trickier with misshapen carrots, eggplant skins, and vegetable tops." How does the tasting menu price stay so low? Telo breaks down the basic restaurant economics as such: "If we were to do a regular dinner service or lunch service [on Sundays] and not sell these items, they're going to become trash, so their value goes down. It's much better to sell everything at a lower cost than to sell a couple things or a few things at a higher cost. That's the way we keep it down." Though a mix-and-match meal of small-plate food scraps at Dan Barber's pop-up was at least $60 per person (before the price of sangria made with bruised fruits), and six of Mimi Cheng's food scrap dumplings cost $8.75, other than the operating and staffing costs of a restaurant, a food scrap is free. To pass health codes and serve food up to par with New Yorkers' palates, the scraps must be tasty, fresh, or preserved in the proper way (pickled, dehydrated, canned), so it's not a question of quality or quantity of food scraps when it comes to price, but branding. When April Bloomfield (or another celebrity chef guest) popped out at the Barber pop-up, gently setting a portion of fried skate bones on your table as if you were sitting at the chef's counter at an elite restaurant, the $15-per-plate price tag still felt like a bargain, but when the ingredients are essentially free, it's the marketing and the chef's talent that you're paying for. 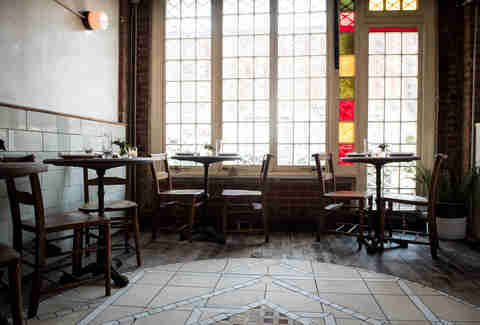 Telo admits that the tasting menu is very much a marketing strategy to get new customers into 21 Greenpoint. "People are willing to come because it's such a great deal," Telo says. There are tons of restaurants surrounding 21 Greenpoint, but the fact that its tasting menu costs the same as a single menu item at a similar restaurant helps it stand out. The menu-less concept for the Sunday dinner also helps keep customers excited, rather than disappointed that a dish sold out, something all restaurants struggle with during regular service. So, why aren't more restaurants doing this? If 21 Greenpoint's tasting menu can be so cost-efficient, good for the environment, a covert publicity tool for the restaurant, and delicious, why aren't other restaurants doing it? Especially when they all have leftovers? "People are a bit hesitant to go and eat at the restaurant that promotes food waste because there is this image in their head about food that should be thrown away but is being served to them instead," Njec says. "Restaurants are trying hard to promote and present an image of perfection, and food waste is just not that." He believes that many restaurants would love to do what 21 Greenpoint is doing on Sunday nights, but don't want to take the risk of an empty restaurant for food waste-averse guests. On top of that, "trying to eliminate food waste in the restaurant means that you have to have a talented and dedicated team that has enough experience to use any kind of product and make it work," Njec says. "Smaller teams like our own can do it, but bigger restaurants that have tons of cooks and chefs, as well as a big turnover… it just wouldn't work. We're not following a set of recipes and steps, but creating food mostly on the fly, just like you would when you are home looking in the fridge and thinking what to do for dinner." Melissa Kravitz is a writer based in NYC who would like to eat more food scraps. Follow her on Twitter.